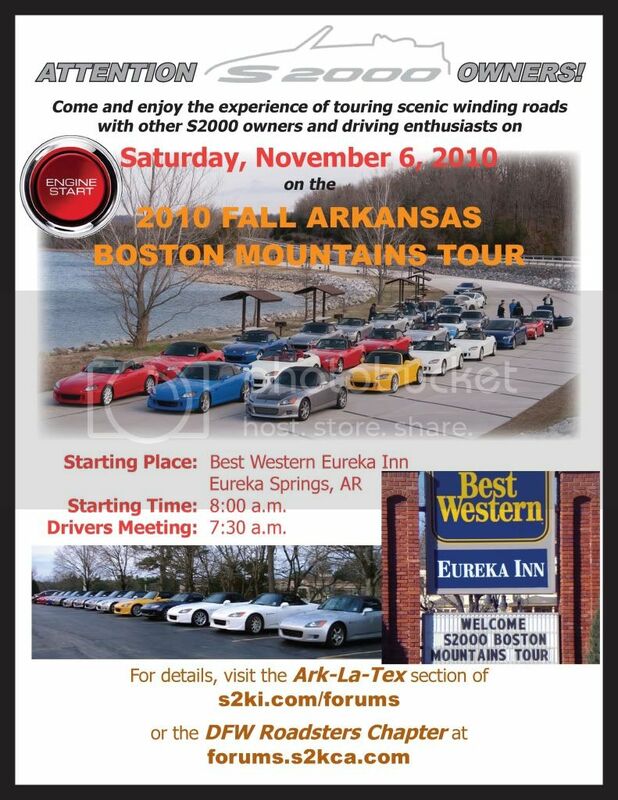 Dear Friends, you are invited to the 8th Semi-Annual Arkansas Boston Mountains Tour, Fall 2010. The day long tour will cover some of the best winding and scenic roads that Arkansas has to offer. Those that have attended in the past can tell you how beautiful and fun this tour is. This is what we all wait for twice a year, the itch is almost able to be scratched!! REGISTRATION OPENS AT 7:00 a.m. AND ENDS AT 7:25 a.m.
Driver's Meeting 7:30 a.m. Tour Start: 8:00 a.m.
We were able to get the same group rate as the Spring Tour $89.95/Night for 2 queen bed room AND INCLUDES full breakfast buffet. We have 12 rooms set aside for our group. Those from out of town, don't forget to make your reservations for 2 nights since we are ending the Tour in Eureka Springs. Added 10/30/10: Dinner will be at Ermilio's Italian Restaurant in Eureka Springs. Ermilio's has won the Arkansas Times Readers Choice awards for : Best Italian Restaurant - All around Arkansas, and Best Restaurant in Eureka Springs. This tour, like tours of the past will be limited to 50 cars. Please Post Your Name, Which State you are from, if you will have a +1, and whether you are confirming your attendance. Confirmed Names will be Bolded. Put me down as confirmed, woohoo! I'm so in! Put me down as going. Andy Put me down sir! Bobby, should I confirm you, or will you keep me posted ?